Reader Chris had his laptop laser-etched last night. He figured it'd look good with every level of Super Mario Land on the Game Boy laid out sequentially. He figured correctly. 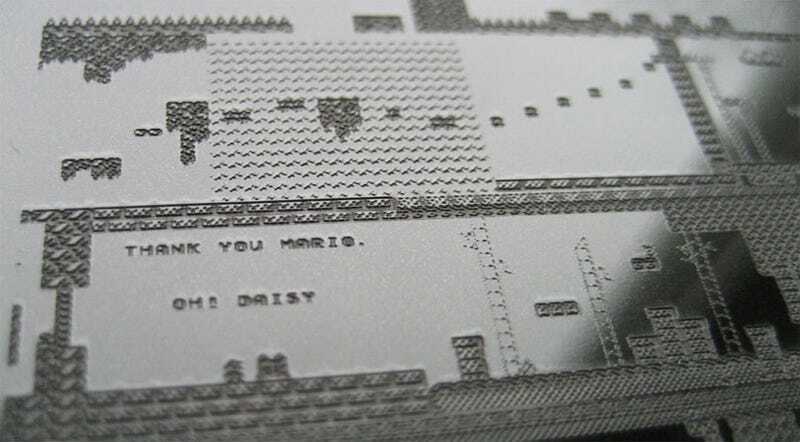 Last night I laser-etched the top of my Eee PC with the complete level maps of Super Mario Land ( on the Game Boy). Everything from the familiar layouts of 1-1 to the climactic battle with Tatanga in the clouds at the end of 4-3 is represented in the etching. This was made possible with the laser cutter at NYC Resistor in Brooklyn ( www.nycresistor.com ), where you can go to get your laptop etched too! I set the laser in raster mode at 70% speed and 40% power to achieve this look. So there you go. If you like the look, you know where you can go to get it shamelessly copied.